Dupont Zytelâ„¢ Carbon Fiber reinforced housing and clear or amber Lexan lens with adjustable rally ring for precise aiming. 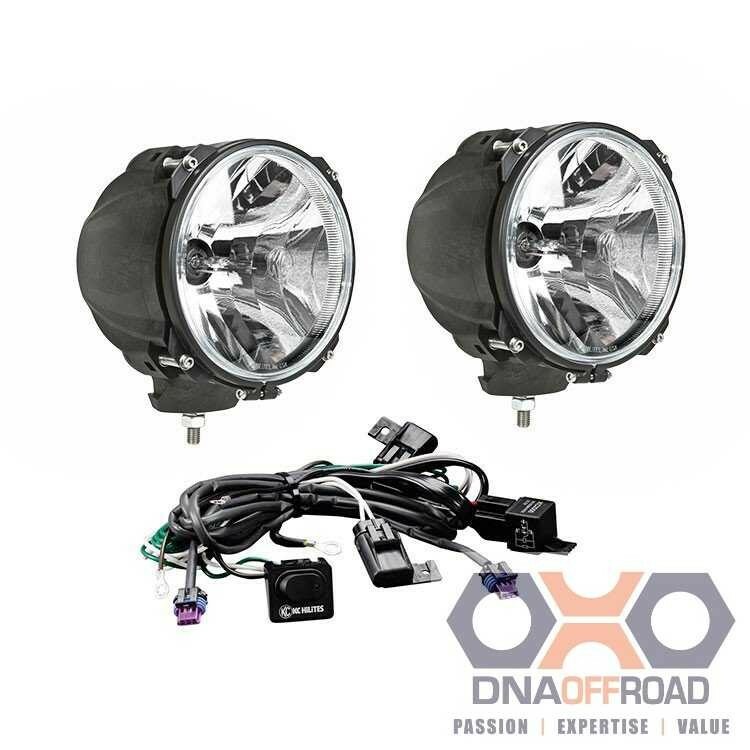 KC's Carbon POD® HID feature powerful 70W HID ballasts with D1S HID bulbs in spot or spread beam. Dupont Zytel™ Carbon Fiber reinforced housing and Lexan lens with adjustable rally ring for precise aiming. Pair includes wiring. -Product Dimensions: W - 7.4" x H - 8.43" x D - 6.63"
7" Carbon PODs deliver up to 11,600 lx @10m with a beam distance of 1,976 meters. Using solid state HID ballasts and HID bulbs with KC precision reflectors, KC's Carbon POD HID is one of the most usable, farthest reaching lights ever. Spot Beam - Lights produce a tight, focused circular beam pattern (often referred to as a pencil beam) that provides maximum forward distance for off-road use. Because the light pattern is generally very narrow, there is minimal peripheral lighting fill or side-to-side lighting. For this reason, Spot beam lights are best used in conjunction with other beam patterns to provide additional width and illuminating areas closer to the vehicle for a more complete beam coverage. Spread Beam - Lights provide a wider area of coverage than spot beam lights. Although they provide considerable forward distance they are not as focused as spot beam lights, providing more peripheral lighting and width. Carbon PODs use an adjustable Rally Ring system to provide easy and precise light adjustment for specific lighting needs. Initially designed for off road race teams, KCRally Rings deliver the most accurate light pattern possible. Constructed from an injection molded composite DuPont™ Zytel® housing with a secure mounting base and stainless steel mounting hardware, ensuring Carbon PODsare always securely fastened.